You'll explore the less-touristy side of things at Mannarasala Sree Nagaraja Temple and Nature & Wildlife Tours. Explore the numerous day-trip ideas around Alappuzha: Kumarakom (Kumarakom Bird Sanctuary & Sree Kumaramangalam Subramanyaswamy Temple) and Kottayam (Vaikom Mahadeva Temple & Bay Island Driftwood Museum). 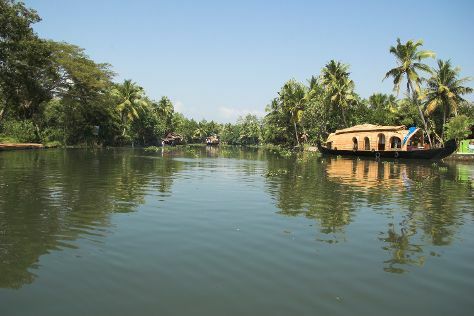 Spend the 27th (Sat) exploring at Kerala Backwaters. There's lots more to do: kick back and relax at Marari Beach, don't miss a visit to Kuttikattu Sree Bhadra Kali Devi Temple, take in the spiritual surroundings of Vishnu Temple, and admire the striking features of St. Andrew's Basilica Arthunkal. To see more things to do, photos, reviews, and other tourist information, read Alappuzha online driving holiday planner . In April, daily temperatures in Alappuzha can reach 39°C, while at night they dip to 30°C. Wrap up your sightseeing on the 29th (Mon) to allow time to travel back home.